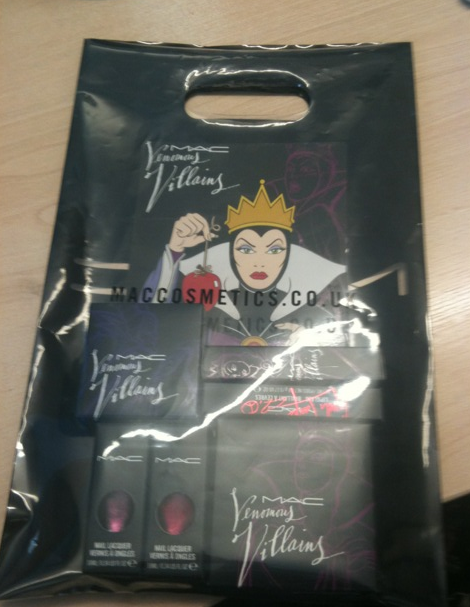 Click and Make-Up Beauty Blog: I've been a bad kitty...no more MAC until Christmas! I've been a bad kitty...no more MAC until Christmas! I 'only' intended to pick up Bad Fairy nail lacquer and possible Oh So Fair 'beauty powder' if I could swallow the £20+ price tag for what is essentially a blusher. But then I saw Strange Potion lipgloss, Dark Magic eyeshadow and Mean and Green nail lacquer (which isn't really that green!). I also spotted the Viva Glam Cyndi and Gaga lipglosses which I hadn't noticed before. I adore the lipsticks and the Cyndi gloss is very pretty, I probably could have done without it, but I was swayed by the sales assistant. I am weak. I'll try and get some swatches up soon, but you've probably seen them all already elsewhere! I know! I've been waiting for this for months and I haven't been this excited about a collection in a long time, however I'm very disappointed that Ursuala (from The Little Mermaid) didn't feature. Some people may think the packaging is tacky but I say bring it on! I want to see a Disney Princess collection next! Haha! I can't afford to get any :( Oh well, drinking my sorrows away in a couple of hours! Are we still meeting outside MAC? You would just have been denying yourself if you didn't bag all these goodies and that would have been a travesty to the world of beauty bloggging and we can't have that!! lol Looking forward to seeing some swatches. I'm on a 'no MAC until Christmas' rule too! This collection has robbed my wallet like crazy - why do they make it all so pretty!? Also, completely agree 100% with the Ursula comment! Great haul and yes I have told myself the same thing, but I probably will be tempted before long.